Some of the most attractive and appealing teapot styles are those made for “little hands” and that are part of miniature sets for your little one’s tea party enjoyment. The variety of such sets is astounding and can range from quite dainty to rather robust. The beauty of such an array of choices is, of course, that there is something to suit every taste! And then there are those miniature sets meant for doll houses or display or maybe those tiny fairies who live under your front porch or in that tall tree in your backyard. A quick online search popped up these as starters. The predominant color for these sets is white, with pink being a close second. Blue is third. Flowers, butterflies, birds, and even seasonal patterns, such as a set with Santa, are common patterns, it seems. Porcelain and ceramic are the most common materials, but I did run across some made of brass. Gold and silver edging are also fairly common. They all have one thing in common: artistry. Some of these sets cost more than full-size sets, which is not surprising due to the extra time and skill needed to make them. Morning Meadows Miniature Tea Service — The miniature tea service set, Morning Meadows, is a must for any tea collector. This porcelain tea set features dainty flowers in blues, pinks and yellows plus bees, ladybugs and butterflies making it a simple, but charming set. Each set includes (1) Teapot, (2) Teacups and Saucers, (1) Creamer and Sugar Bowl, and (1) Tray. Morning Meadows Miniature Tea Service makes a great gift! This product is not large enough for actual use. Hand wash only. FDA approved. Tray Dimensions: 3.75″H x 9″W x 7″D. Be sure to take a look at our Morning Meadows Teapot, Tea for One, and Teacup and Saucer Set. Flower Fairies Mini Collector Tea Set w/Tray — This miniature collector tea set features the Rose Fairy from our Flower Fairies™ collection. Each porcelain piece is hand-embellished in real gold. Set includes two 1¼” plates, two ½”oz tea cups/saucers, 1″ Tall tea pot, sugar & creamer and 2″x 3″ serving tray. Decorative – not for food use. This is a scale miniature & not intended for children under 14 years of age. Deluxe Porcelain Mini Tea Set — This lovely 21-piece set is packed inside a fancy wicker carry case and includes an 8 ounce tea pot with lid, 4 cups with matching saucers, 4 spoons, sugar bowl with lid, a creamer and 4 cotton napkins. The napkins are machine washable and the porcelain pieces are dishwasher safe. 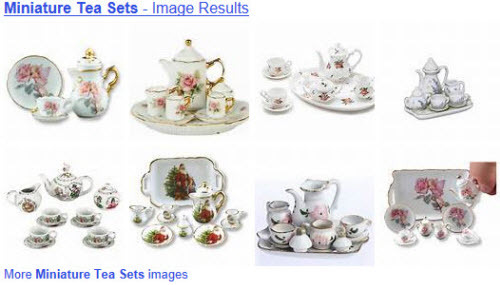 Dimensions: Plates – 3.5 inches; Cups – 2.75 inches W x 1.25 inches H; Sugar – 2.5 inches W x 2.5 inches H; Creamer – 2.75 inches W x 1.75 inches H; Teapot – 5.75 inches W x 3.5 inches H; Spoons – 3.25 inches L.
This adorable 17-piece porcelain tea set is packed in a durable pink vinyl carry-case. Set includes 4 1/2″ tall tea pot with lid, four tea cups, four saucers, four teaspoons, creamer and sugar bowl with lid. Set decorated with an exclusive pattern. Dishwasher safe. Pirouette Miniature Tea Service — This lovely miniature tea service set features darling ballet shoes and small raised floral designs on a pallet of pink and white. This ceramic set is hand painted and comes in its own storage box. Handwash only/FDA approved. Dimensions: Teapot is 4 1/4’H X 1 1/2″Opening and holds 11 ounces. Teacup holds 4 ounces. Hey, I just had a thought — these might be just the thing for that little “tea princess” on your gift list!